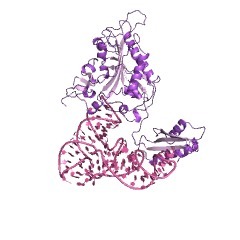 This is the anticodon binding domain found in some phenylalanyl tRNA synthetases. The domain has a ferredoxin fold, consisting of an alpha+beta sandwich with anti-parallel beta-sheets (beta-alpha-beta x2). 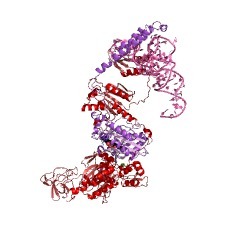 Aminoacyl-tRNA synthetases (aaRSs) play a crucial role in the translation of the genetic code by means of covalent attachment of amino acids to their cognate tRNAs. Phenylalanine-tRNA synthetase (PheRS, also known as Phenylalanine-tRNA ligase) is known to be among the most complex enzymes of the aaRS family. Bacterial and mitochondrial PheRSs share a ferredoxin-fold anticodon binding (FDX-ACB) domain, which represents a canonical double split alpha+beta motif having no insertions. 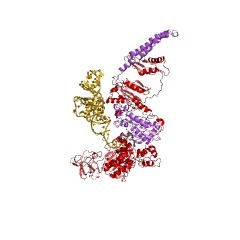 The FDX-ACB domain displays a typical RNA recognition fold (RRM) formed by the four-stranded antiparallel beta sheet, with two helices packed against it [(PUBMED:7664121), (PUBMED:9016717), (PUBMED:10049785), (PUBMED:12962494), (PUBMED:18611382)]. There are 24139 FDX-ACB domains in 24139 proteins in SMART's nrdb database. Taxonomic distribution of proteins containing FDX-ACB domain. This tree includes only several representative species. 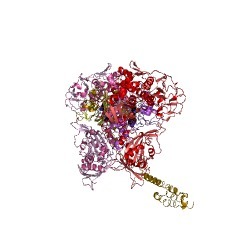 The complete taxonomic breakdown of all proteins with FDX-ACB domain is also avaliable. 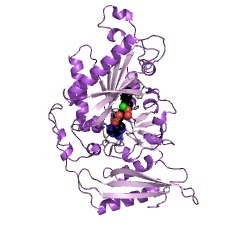 Click on the protein counts, or double click on taxonomic names to display all proteins containing FDX-ACB domain in the selected taxonomic class. The crystal structure of phenylalanyl-tRNA synthetase from thermusthermophilus complexed with cognate tRNAPhe. BACKGROUND: In the translation of the genetic code each aminoacyl-tRNAsynthetase (aaRS) must recognize its own (cognate) tRNA and attach thecorresponding amino acid to the acceptor end of tRNA, discriminating allthe others. 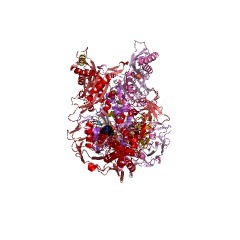 The(alphabeta)2 phenylalanyl-tRNA synthetase (PheRS) is one ofthe most complex enzymes in the aaRS family and is characterized byanomalous charging properties. 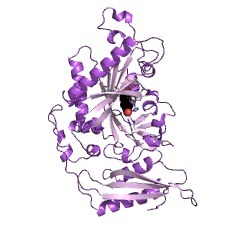 Structurally, the enzyme belongs to classII aaRSs, as its catalytic domain is built around an antiparallel betasheet, but functionally it resembles class I as it aminoacylates the 2'OHof the terminal ribose of tRNA (class II aaRSs aminoacylate the 3'OH).With the availability of the three-dimensional structure of the complexbetween multisubunit PheRS and tRNAPhe, a fuller picture of the specifictRNA-aaRS interactions is beginning to emerge. 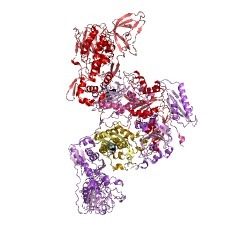 RESULTS: The crystalstructure of Thermus thermophilus PheRS complexed with cognate tRNA hasbeen solved at 3.28 A resolution. 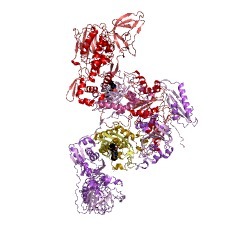 It reveals that one tRNAPhe moleculebinds across all four PheRS subunits. The interactions of PheRS with tRNAstabilize the flexible N-terminal part of the alpha subunit, whichappeared to form the enzyme's 11th domain, comprising a coiled-coilstructure (helical arm) built up of two long antiparallel alpha helices.The helical arms are similar to those observed in SerRS and are in thesame relative orientation with respect to the catalytic domain. 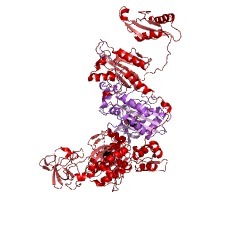 Anticodonrecognition upon tRNA binding is performed by the B8 domain, the structureof which is similar to that of the RNA-binding domain (RBD) of the smallspliceosomal protein U1A. The Th. thermophilus PheRS approaches theanticodon loop from the minor groove side. CONCLUSIONS: The mode ofinteractions with tRNA explains the absolute necessity for the(alphabeta)2 architecture of PheRS. 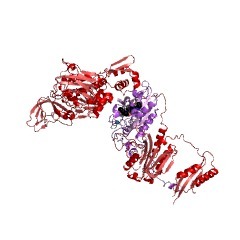 The interactions of tRNAPhe with PheRSand particularly with the coiled-coil domain of the alpha subunit resultin conformational changes in TPsiC and D loops seen by comparison withuncomplexed yeast tRNAPhe. The tRNAPhe is a newly recognized type of RNAmolecule specifically interacting with the RBD fold. In addition, a newtype of anticodon-binding domain emerges in the aaRS family. Theuniqueness of PheRS in charging 2'OH of tRNA is dictated by the size ofits adenine-binding pocket and by the local conformation of the tRNA's CCAend.